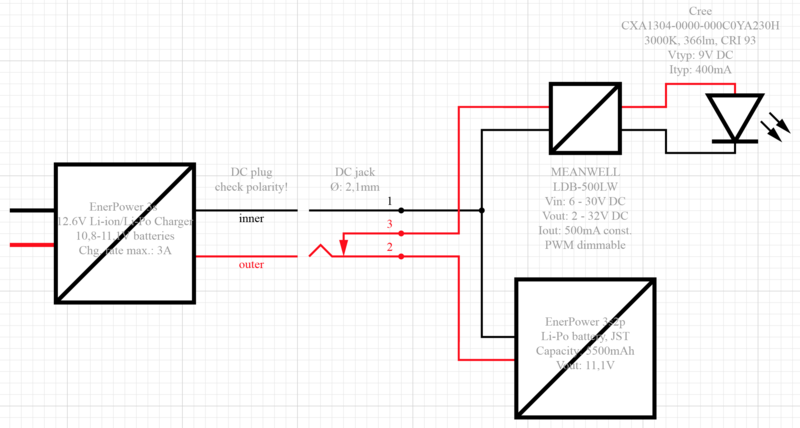 I want to use the switch function of a DC-jack to disconnect a load when a battery charger is connected to a battery which powers a constant current source that powers an LED. Is the wiring shown below the way to do it? Namely, when the charger's plug is plugged in, 3 disconnects and the battery charges, with the load not simultaneously drawing from the battery? Yes, your schematic is correct. You may need to test though to make sure that there isn't a momentary short-circuit at any time during insertion. Most will probably connect the charger to the battery prior to opening the switch contact. Not the answer you're looking for? Browse other questions tagged battery-charging connector or ask your own question. MCP73833 suitable for charging battery and system at the same time? How is it physically possible that there is no voltage drop across two pins of this DC jack? How to disable the remainder of a circuit when a charger is plugged in, using minimal components?